The TTABlog®: The Trademark Reporter's "Annual Review of U.S. 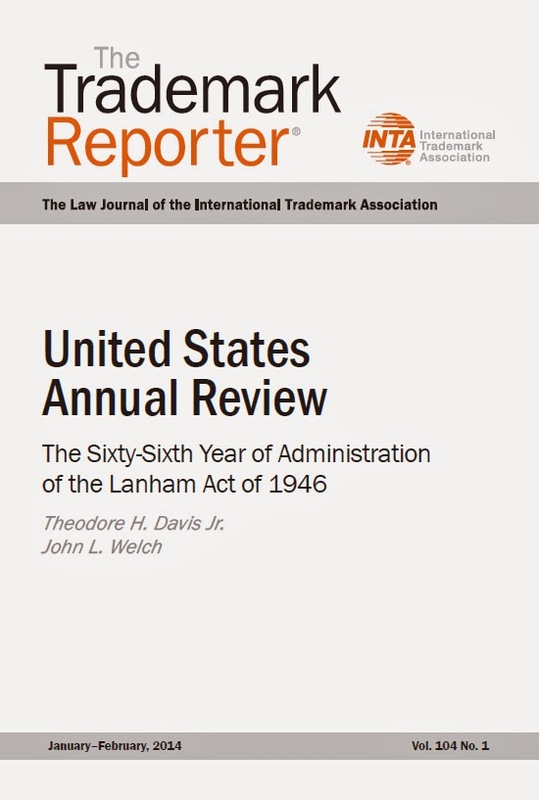 Trademark Cases"
The Trademark Reporter's "Annual Review of U.S. Trademark Cases"
The Trademark Reporter has published its Annual Review of U.S. 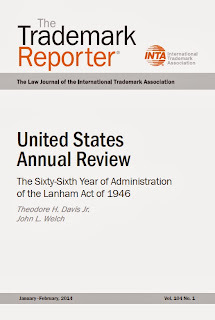 Trademark Cases: "The Sixty-Sixth Year of Administration of the U.S. Trademark (Lanham) Act of 1946," by Theodore H. Davis, Jr. and yours truly, John L. Welch. (pdf here). Ted Davis observes in his Introduction that the Supreme Court has taken an uncharacteristic interest in the Lanham Act of late, with three cases now on its docket: one currently under advisement (Static Control v. Lexmark), a certiorari petition granted in another (Pom Wonderful v. Coca-Cola), and an invitation to the Solicitor General to provide his views on whether the Court should issue a writ of certirorari in a third (B&B Hardware v. Hargis). Of course, that's just the tip of the iceberg in Ted's comprehensive review of trademark law in the courts. Back at the TTAB, with its narrow focus on registrability, the issue of fraud remained essentially dormant, while dilution and lack-of-bona-fide-intent receded into the background as well. Non-traditional trademarks took center stage, as trademark practitioners continued to probe the outer limits of registrability. In these and other cases, the Board kept a close eye on whether a purported mark actually functions as a trademark. TTABlog note: Thanks again to The Trademark Reporter for granting permission to provide a link to this issue, which is Copyright © 2014 the International Trademark Association and reprinted with the permission of The Trademark Reporter®, 104 TMR 1 (January-February 2014). Text Copyright John L. Welch 2014.